Huawei Honor 8X smartphone comes with a 6.5 inch touchscreen display with a resolution of 2340 x 1080 pixels and adoption of a notch design. It’s made from 2.5D textured aurora glass, which is layered to catch the light, like on the Honor 10. The eye-catching glass back sports a fingerprint sensor and folds into a metal frame, with the power and volume keys on the right spine. 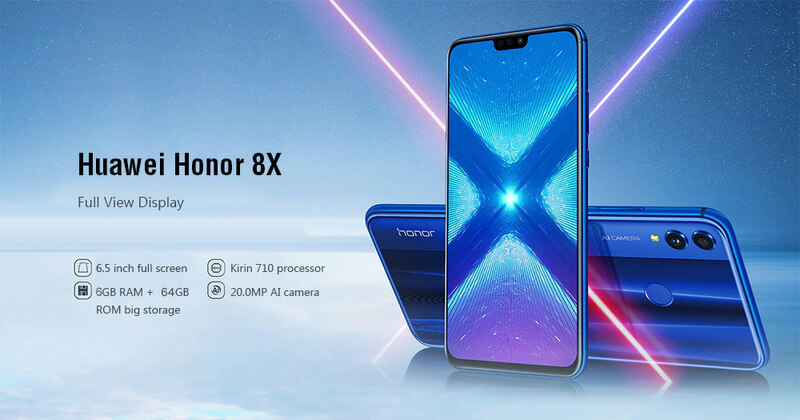 The Huawei Honor 8X is powered by 2.2GHz octa-core processor, it comes with 6GB of RAM and packs 64GB of internal storage that can be expanded up to 256GB via a microSD card. As far as the cameras are concerned, the Huawei Honor 8X is equipped with a 20.0MP (f/1.8) + 2.0MP primary camera on the rear and a 16.0MP front shooter for selfies. It runs on Android 8.1 operation system and is powered by a 3750mAh big capacity battery. Honor 8X is a dual SIM (GSM and GSM) smartphone that accepts Nano-SIM and Nano-SIM. With 4.25mm narrow bezel and 91% screen to body ratio, honor 8X brings a wonderful visual enjoyment. The 6.5 inch large screen with rounded corners delivers maximum vision when you watch videos, browse websites or play games. The big screen but a small body size just like a 5.5 inch phone, giving you an excellent hand feeling. Adopting Kirin 710 with octa core and 2.2GHz frequency, the Honor 8X brings you a faster and smoother running experience. This CPU has been optimized to reduce to lower power consumption and provides a higher perfermance. The 20.0MP rear camera with a f/1.8 aperture can capture ultra-clear image details. The AI technology can achieve more than 500 scenes of intelligent identification and let you take a professional and artistic picture in a single shot. Quick in taking photos and never miss a single moment. 16.0MP front camera features an effect function, helping you selfies stand out on social media. The 3750mAh battery with intelligent power saving technology has been strengthened by 40% battery perfermance. That means you can spend more time on using Honor 8X, instead of charging frequency. What are the differences between iPhone Xs, Xs Max, Xr with iPhone X? How to open the phone that has a phone lock and you forgot it? What do you think is the best version of iOs ever?